We challenged our engineers to develop ultra-high performance camper tie downs to meet and exceed the toughest demands from avid sportsmen and adventurers. One of the biggest problems with ratchet straps is that you have no way of measuring the amount tension being applied to the tie downs on the truck. This is critical due to the fact that manufacturers require 300 pounds tension at each truck camper anchor point. Inability to measure the load being applied by the ratchet straps makes it very easy to damage either the tie downs, the truck frame or the camper’s anchor points if there is too much tension. On the contrary, when less than the proper tension is applied, the truck camper can shift and damage both the camper and the truck bed. We looked to create pickup camper tie downs that when used with spring-loaded truck camper turnbuckles such as the No. 1 selling FastGun turnbuckle, the SpringLoad XL, Basic SpringLoad, and AnchorGuard turnbuckles, that the whole system replaces potentially hazardous ratchet straps and keep your camping experience safe and enjoyable. Talon tie downs are the latest in cutting edge tie down systems that will not only meet, but exceed the toughest demands you can make during camping trips. These no-drill truck camper tie downs offer dramatic improvement with vehicle handling and stability. Torklift pickup camper tie downs, made from aluminum or stainless steel, are designed to handle the toughest climates and terrain. Whether you head out to the coastal beaches or up to the mountains into the snow and ice where harsh chemical treatments are prevalent, nothing outperforms Talon tie downs. We design each individual slide-in camper tie down to fit with specific truck makes and models and install them by bolting them directly to the frame using existing factory mounting points – the strongest part of the truck! With these no-drill frame-mounted tie downs, holding down your truck camper is a breeze and won’t damage your truck bed or bumper. These aluminum and stainless steel tie downs for truck campers come with rust free corrosion protection for life and a completely no-drill installation. 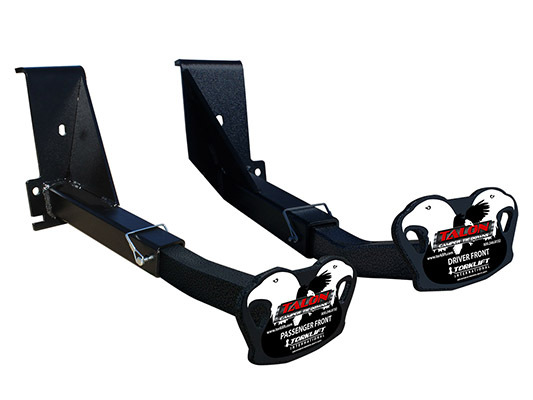 True to their name, these Talon truck camper tie down options are always ready to push the envelope while keeping your family, truck and camper safe. From your driveway to the highway, to the razors edge of adventure and back, Talon equals performance.